On Wednesday, Jan. 30, the Task Force on Teaching Effectiveness (TFTE) held the first of three townhalls engaged in a single question: how can the Institute evaluate and raise teaching effectiveness better? The main metric of teaching performance evaluation has been the Course-Instructor Opinion Survey (CIOS), which is sent to students at the end of each semester. However, there are several modifications that could yield potential improvements according to Lizanne DeStefano, the associate dean for Outreach in the College of Sciences and the director of the Center for Education Integrating Science, Mathematics and Computing. For example, DeStefano presented wording changes to the qualitative CIOS questions that were developed over a series of focus groups with students, opting for clearer, non-redundant phrases that could be interpreted better by student responders and faculty members reading the answers. A summer 2018 pilot showed using the new questions did not depress response rates or substantially alter the quantitative CIOS responses, and thus the changes can likely be safely expanded to the entire student population. One of the more controversial options that TFTE and its predecessor, the CIOS Task Force, have examined is whether to allow deans and school chairs to view qualitative CIOS results in a series of focus groups run by the CIOS Task Force. In 2017, “48 faculty participants voted in favor of releasing comments to relevant administrators, 41 voted against the proposal, and 23 indicated that they were not sure,” according to the September 2017 task force report. Cited as the largest concern among faculty is that sexist or racist comments that students write about female and minority faculty members — or simply the combined weight of their implicit biases — would be elevated to be seen by administrators, and thereby affect decisions like promotion and tenure. Currently, there are multiple issues that could reduce the effectiveness of CIOS as metric. Most importantly, DeStefano cited that there were “huge fluctuations” in CIOS response rates between sectors. Additionally, half of instructors receive an average of 4.7 or above on the overall effectiveness question — raising questions of inflation. Either way, there is an active issue of how faculty members who consistently fall on the lower tail end of the CIOS distribution. 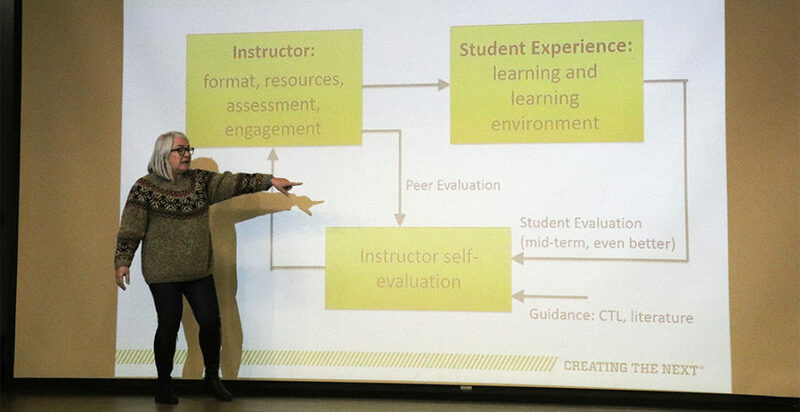 DeStefano emphasized that CIOS and other student evaluations must be incorporated into a larger framework of self and peer evaluation in order for faculty members to assess and improve their teaching abilities. “If you look at the general literature on teaching effectiveness, the consensus — general, widely stated consensus — is that to get a good picture of teaching evaluation you have to have sort of a triangulation of student opinions, student evaluations, self evaluation and peer evaluation,” DeStefano said. For self evaluation, one recently started program is to have Tech lecturers submit teaching portfolios, something that potentially could be expanded to academic professionals and tenure-track faculty in promotion procedures. Ferri argued teaching a student requires a village of instructors. “Teaching students — educating students is a larger thing. It’s the entire curriculum that they go through,” Ferri said. “Right now we have the faculty involved in approving courses, approving the syllabi of courses, approving all of those things on the front end, but nothing on the back end. Despite the critical nature of the discussion, only a few people attended the town hall. “And also from the SGA, from the student’s perspective — we want them to participate in this as well,” Ferri said, beckoning to the students in the audience. “We need that. Other town halls will be held on Feb. 1, from 3 to 4 p.m. in the Student Center Theater, and Feb. 5. in Student Center, Room 320.